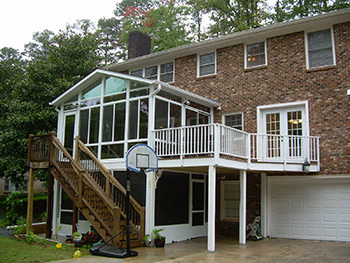 When considering building a sunroom in Atlanta, you’ll want to make sure you take precautions to protect yourself from the sun’s UV rays. There’s no question that the sun is important. It sits right in the middle of our solar system and is basically why we have various climates and different types of weather. Atlanta, in particular, has a tendency to be very hot and humid in the summertime. While most people do enjoy being out in the sun, some people burn very quickly or face the risk of getting skin cancer, which is why an environmentally sound sunroom can actually help you reduce the risk of potentially dangerous skin issues, while also providing an energy efficient element to your home. The Earth’s magnetic field serves as a barrier that prevents electrons and protons from reaching us. Yet, we are not immune to Ultra-Violet, or UV, rays, which contain electromagnetic radiation that can, if not protected, lead to harmful afflictions such as sunburn and skin cancer. To put it into perspective, the sun is a star with a luminosity that produces up to 400 septillion watts of power. The energy it creates per second is equivalent to one trillion one-megaton bombs. That’s a lot of rays being aimed in our direction. If you’re planning on building a sunroom, you should use filtered, or low emission glass; these windows are coated with a chemical layer that will block out UVB (or shortwave) rays, which are known to cause skin cancer. Filtered glass is very energy efficient, but there are several varieties such as single solex, double and triple pane…all of which have different levels of efficiency. You may also want to consider toughened glass, the kind found in car windshields, if you have children, as the glass crumbles in the event that it breaks. If you want to keep the sun out at different times, you can add a variety of accessories to your sunroom such as vertical shades and wooden blinds that add a nice touch. Cellular shades are incredibly energy efficient double cell shades that help keep the room warm, and bright, while blocking out harmful UV rays. Sunshades are another way to shoo away UV rays and alleviate potential sun damage. Most sunshades come in a variety of colors and have different levels of woven transparency that can highlight any sunroom. They are primarily made out of ecologically sound material that while proven effective in preventing UV, also helps diffuse light and eliminate annoying glare, while still keeping your sunroom warm. They also help keep your furniture from fading if it’s in direct line of the sun. Another simple and effective way to block out some of the sun’s rays is to build your sunroom with a sun shade gable, like those pictured here. These are just a few possibilities for creating a safe and energy efficient sunroom in the Atlanta area. For more information, please contact the experienced professionals at DC Enclosures to schedule your complementary in-home consultation.